Shoebox Legends: Signature Sundays (On a Tuesday) - Cam the Canuck! Signature Sundays (On a Tuesday) - Cam the Canuck! Tonight I've got one of my favorite hockey pick-ups so far in 2018 to share with you. I intended to get this post together and published on Sunday but never found the time, so instead you're getting a 'Signature Sundays' post on a Tuesday. My blog, my rules. With that out of the way, let's get down to it...here's my latest hockey autograph! 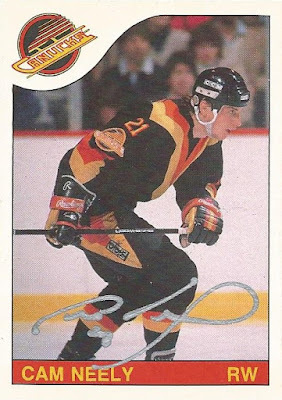 Before Cam Neely blossomed into a bruising winger who'd regularly pot 50 goals in a season for the Boston Bruins, he began his NHL career as a teenager with the Vancouver Canucks (look at that glorious 'Flying V' sweater!). Vancouver took him with their first round pick (9th overall) in the 1983 entry draft, and made a huge mistake when they bailed on him after just three seasons. The team felt that Cam was a liability defensively, and shipped him to Boston in trade at just 20 years of age. He'd go on to become one of the most dominant forwards in the entire league over the course of the next few seasons in a Bruins sweater, and the rest is history. I've always been intrigued by short term stops; cards that feature players with a team that you don't typically associate them with, especially so for superstars of the game. 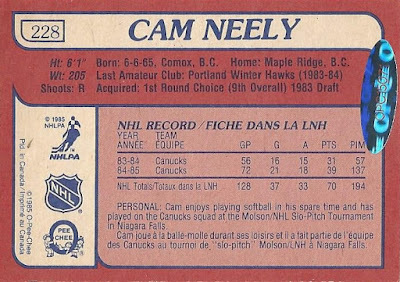 Cam's time with the Canucks certainly qualifies, and when this 2007-08 O-Pee-Chee buyback autograph of Neely's '85-86 card popped up on eBay a few weeks back I absolutely knew I needed to make a play for it. 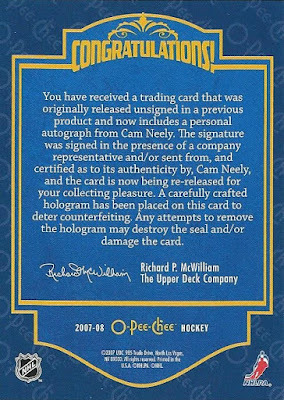 Amazingly enough, in all the years I've been back at collecting here, and with all the hockey autographs I've picked up in that time, I'd never managed to land a Neely auto. Well, I obviously took this one home, and at less than the cost of a blaster shipped I'm satisfied with this nice on-card autograph of the HOFer in silver ink! Here's a look at the back. The other reason I enjoy this one is that while I'm a Bruins fan these days, I really wasn't during the time that Cam played with the B's. I was a Whalers fan growing up, so I actually kind of detested those late '80s/early '90s Bruins teams since they were Hartford's arch-rival. 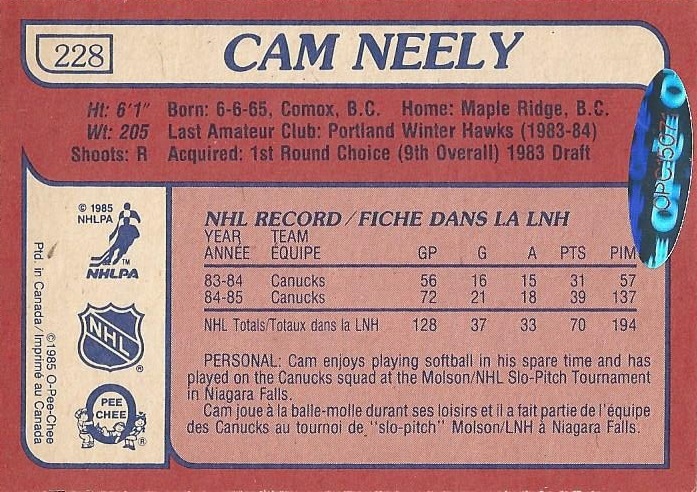 As odd as it seems, if I could only ever own one Cam Neely autograph I'd prefer it be a Canucks card like this one. I'm sure I'm in the minority there. 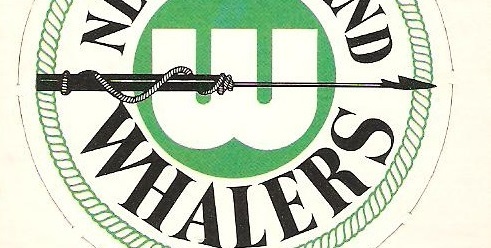 RIP Hartford Whalers! 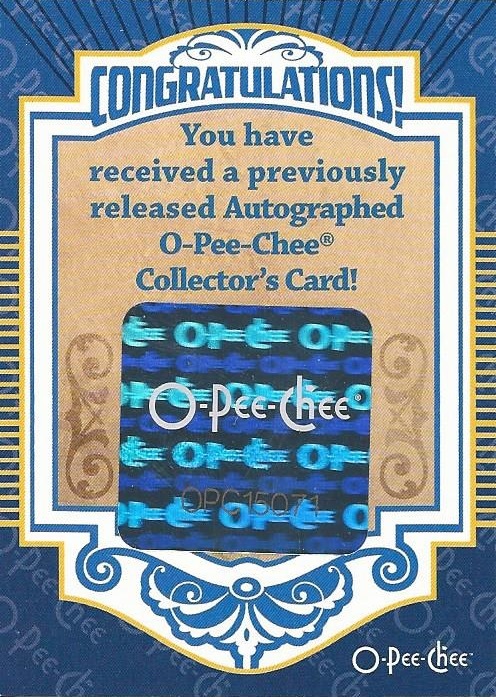 Here's the CoA that comes with each of these O-Pee-Chee buybacks. I always appreciate when the seller includes this, while I don't plan on selling this card anytime soon it's nice to be able to keep this with it anyway. The serial number on this holographic sticker matches that of the sticker on the back of the card. Here's the back of the CoA. Bonus points to Upper Deck for actually customizing each back to state the name of the player. 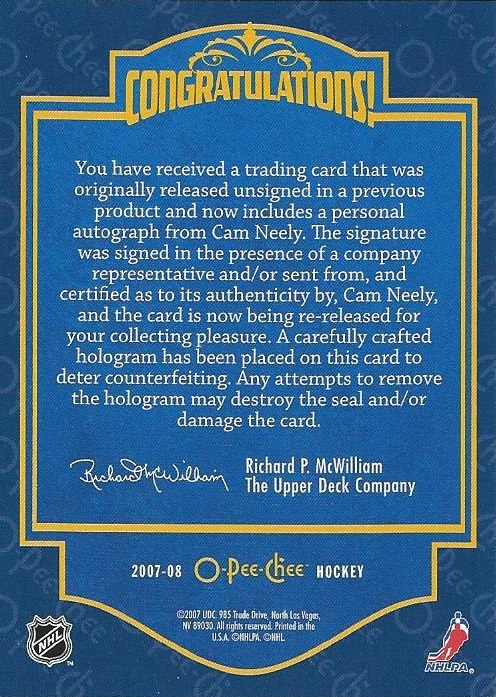 For some reason the fact that this says "...includes a personal autograph from Cam Neely" makes it feel much more significant than something generic like "...includes a personal autograph from the athlete depicted on the card". 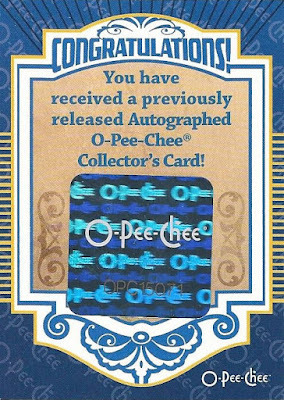 Ah, 2007, back when card companies cared! It's always been fascinating to me to consider what may have been with Cam. His career was famously cut short by devastating knee injuries, and in the end he played in only two full seasons worth of games after his age 25 campaign. Despite that, he still managed nearly 400 career goals including three 50+ goal seasons, and over 1,200 career penalty minutes. He was elected to the Hockey Hall of Fame in 2005. 80's hockey cards are the best, I love those vibrant Vancouver unis. That sure is a sweet card. Less than a blaster only adds to the luster. Neely was traded along with a first round pick to Boston. The Bruins chose Glen Wesley with that pick. Barry Pederson was the player traded away. Bruins would later trade Wesley to your beloved Whalers for Hartford's first round draft pick three years in a row.